When Lauren asked me to write a guest blog I got a little nervous. As readers of her blog, you know she is very creative and talented when it comes to cakes and confections. I am a new mom with little time to spare and I am best known for quick and easy meals and tricks like my fake-out alfredo sauce. I had trouble coming up with a recipe that I deemed worthy of her blog. I have been Gluten Free for over 2 years and I can tell you from first hand (and full tummy) experience that Lauren's Gluten Free goodies taste just as good as the Gluten kind, so I knew this one had to be worthy of something she would create. 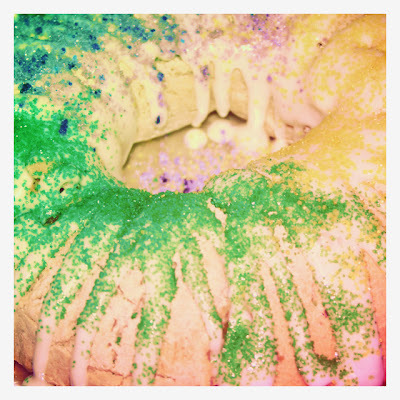 After several attempts and a powdered sugar explosion in my kitchen I give you just in time for Mardi Gras, Gluten Free King Cake! Cake all ready for the oven. Yum! This cake reheats well in the microwave for 15-20 seconds! 1. In a Large bowlcombine all wet ingredients. 2. In a separate bowlcombine dry ingredients. 4. The dough shouldnot be sticky and should be easy to work with. Add more brown Rice flour asneeded. 2. Once the dough isrolled into a rectangle, spread the cinnamon sugar filling across the entiresurface. Next place 1/4 cup of cream cheese filling in a piping bag or Ziploc bag and cut off the end. Place a 1" stripe of cream cheese down thelong side of the rectangle closest to you. Roll the dough jelly roll style intoa log. Transfer the log to a baking sheet (sprayed with cooking oil) with theseam side down. Form the log into a ring and use a little water to help moistenand seal the ring. Mist with cooking spray and cover with a cloth for 30-45 minutesfor the dough to rise. 3. Bake the cake for 20minutes or until the top is golden brown. 4. While the dough isbaking, take the left over cream cheese filling and prepare the frosting. Addthe remaining ingredients and mix. The consistency should be firm enough tostay put, but soft enough to drape. 5. When the cake hascooled slightly (but is still warm), drizzle with frosting and sprinkle withcolored sugar (each color should cover approx 1/3 of the cake). yum! i just recently had my first king cake. i'm sure i'd like a gluten-free version too.